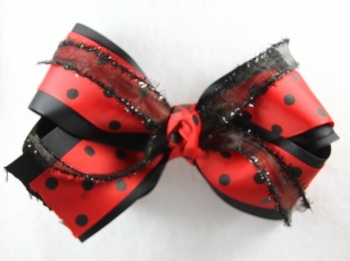 This is a fabulous red and black bow to help you remember Cruella Deville going after those famous 101 puppies. This is a large sized bow that has double layers of ribbon. The bottom layer is a 2.25" black grosgrain ribbon that is layered with a 1.5" red grosgrain ribbon that has black polka dots all over. Then 2 black sheer ribbons lay across the top and are wrapped with the same polka dots ribbon into a French knot. Already attached to a French clip so it is ready to go.